I’ve mentioned before that Cody and I are obsessed with Mexican food, right? Well, it’s kind of a problem considering the fact that it’s such a carb-heavy cuisine. Most of all, we love tacos. We’ve made tacos with lettuce wraps (Blackened Mahi Lettuce Tacos) and we’ve made taco salad, but sometimes we just crave tacos with a crunchy hard shell. 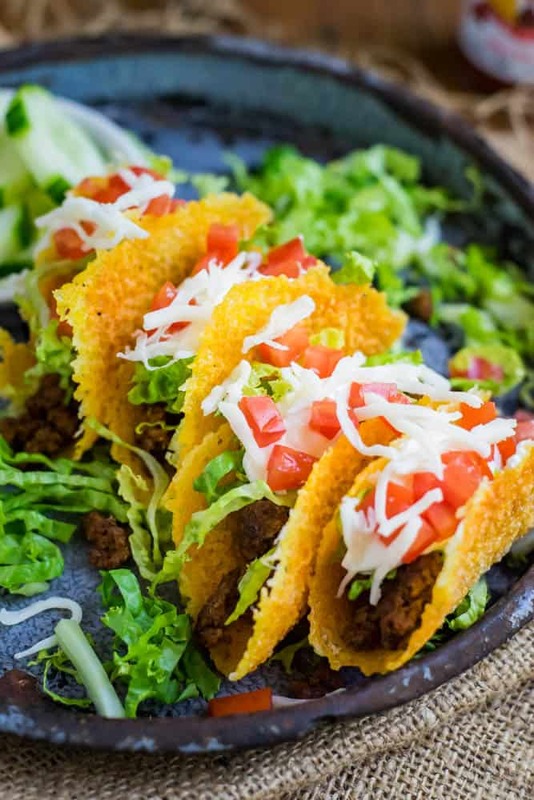 We did a little brainstorming and thus – our Low-Carb Mini Cheese Tacos were born! Whooohooo! I’m super excited to share these with you today! 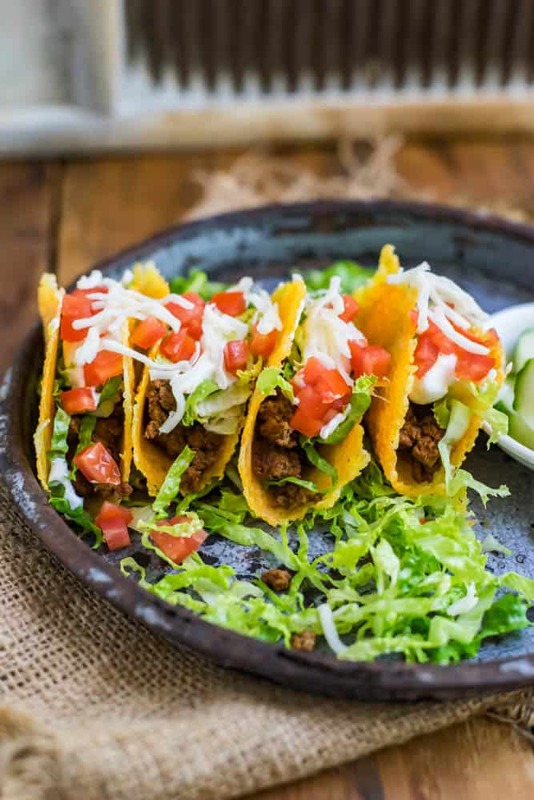 Using only 6 easy ingredients, and next to nothing prep time, you’ll have this delicious carb-free Mexican fiesta on your plate in no more than 20 minutes. What more can you ask for, honestly? A little bit of cheese gets microwaved for 1 minute, carefully scooped up and draped over the side of a baking dish, and voilà! A crunchy hard taco shell! Magic! 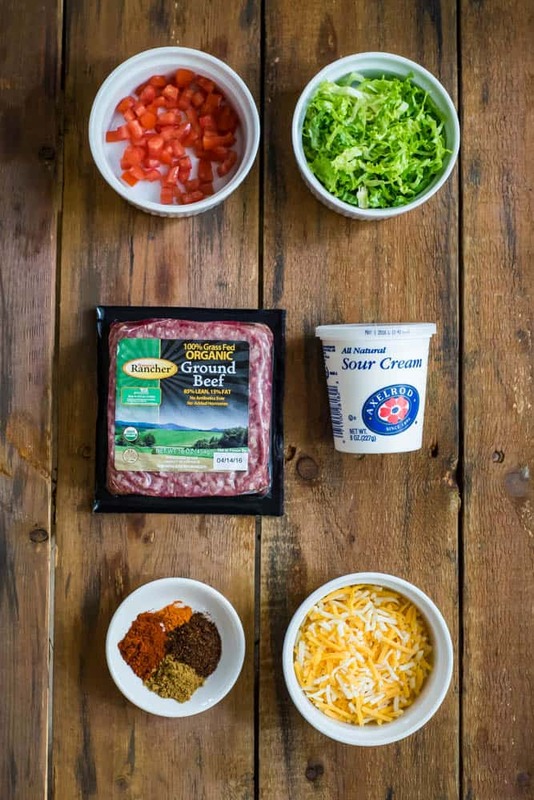 Fill that with some yummy ground beef and top it up with some lettuce, tomato, sour cream and a sprinkle of more cheese (if you love cheese like we do). Update: At the end of April we’re going Asheville, NC for our week-long honeymoon. After that we’re heading down to Orlando to spend a few days at Disney World with my mom and sister. Then, as soon as we get back, our custom-made trailer for our Tiny House on Wheels should be ready to pick up. We’re about to place the order and we can barely contain our excitement! We’ve been in love with the whole concept of tiny houses since the first time we came across it and we can’t believe that we’re about to take the plunge ourselves! As I mentioned before, we will be documenting the whole process on our youtube channel and most likely add a tiny house section here on the blog as well. We’ll be sure to post it on all our social media and once it gets going, we’ll make an official announcement. For now, though. Let’s eat some tacos!! Brown the ground beef over a medium high heat. Once browned, add the spices, salt, pepper and water. Simmer until the ground beef is at your desired level of sauciness. While the ground beef simmers, you make the microwave tacos. A 1/4 cup of cheese is enough for two tacos. Divide the 1/4 cup into two thin rounds and put in the microwave for approximately 45 - 60 seconds (This will vary with different microwaves). Once they feel crispy to the touch, carefully lift them from the plate and drape them over the side of a baking tray until cooled. Once you've made 8 shells, fill with the toppings and enjoy! YESSSS! 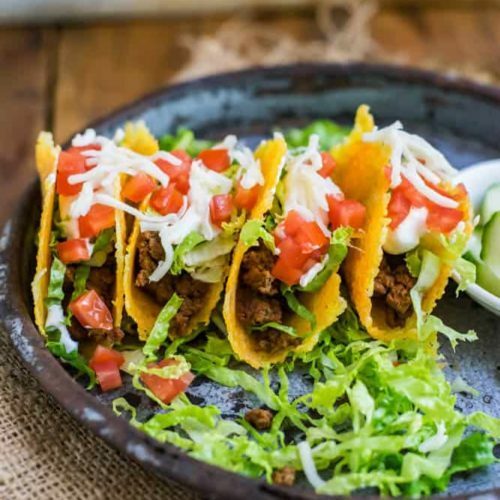 A low-carb option for the taco-obsessed! AND it’s done with the magic of cheese. Couldn’t love this recipe any more!